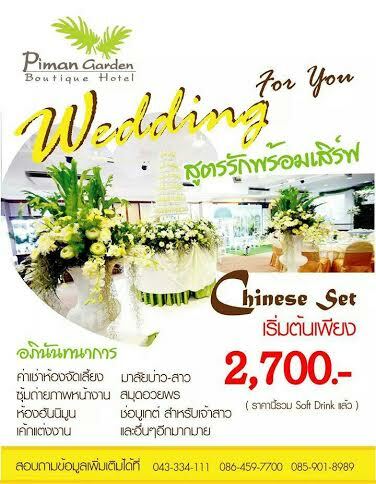 PIMAN GARDEN:- "Set back off the road around a lovely garden. Piman offers serenity and privacy despite its city center location. The attractive rooms all come with safes, fridges and free Wi-Fi, plus most have balconies or porches." Ideally located just minutes away from Khon Kaen city center attractions, bars and Banquets, Piman Garden provides quality hotel accommodation and has become a "must stay" hotel for tourist vistors and business travelers alike. The hotels rooms are located on three floors (with lift access) and all have garden views. Near to the Vietnam Consulate, Laos PDR Consulate and Central Plaza shopping center. Use our Khon Kaen map to find their locations. The hotels service includes 24 hour reception with English speaking staff, covered car parking with security and our on-site Banquet, "Home Kitchen" providing Thai, Vietnamese and Chinese dishes. A selection of Banquets, food stalls, 24 hour "Family Mart" and "7-Eleven" convenience stores are found near to the hotel along Klang Muang road.